Another year gone by, the clocks gone back and the Christmas decorations and adverts are in full swing a whole 2 months before the festive season, it must mean it’s time for the annual Call of Duty instalment. 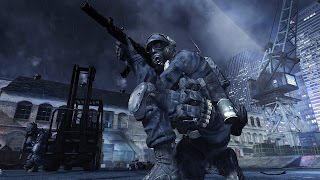 This year it comes in the form of the commercially-successful Modern Warfare series (hereafter MW) but no longer spear-headed by the same Infinity Ward, critics and fans lauded back in 2007 & 2009. Ever since the creative forces of West & Zampella left the studio due to on-going differences with publisher Activision, the brains behind the machine have changed but the formula remains very much the same. Can such a successful series with such a huge following manage without its creators? And are two developers (Sledgehammer Games & Infinity Ward) better than one? Modern Warfare campaigns have always been something of a spectacle and it seems that same can be said about this year’s iteration. 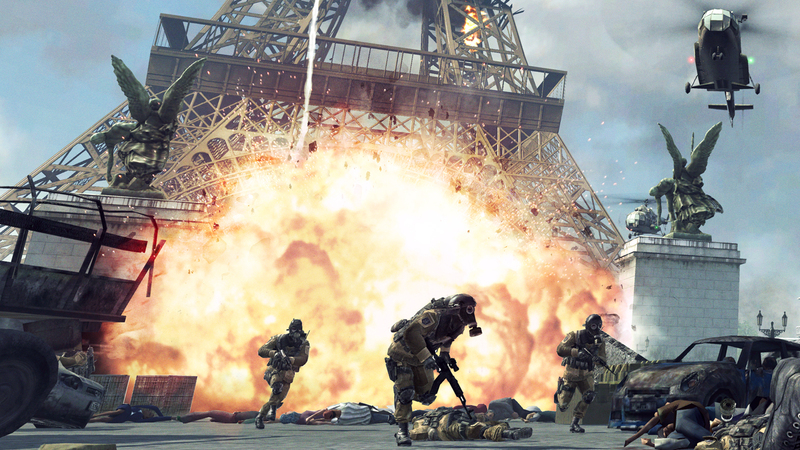 Often chastised as the “Michael Bay” experience of the video-gaming industry, the action-packed set-pieces, slow-motion moments and the commandeering of various vehicles all make their return in MW3. MW3 picks up right from where MW2 left off, so if you’re here for the story and haven’t played the previous entries in the Modern Warfare series, you might consider picking them up if you want a complete experience. In short the premise is obvious (and even pointed out in the advertisements), World War 3 is here. From the outset, you’re plunged into war-torn New York battling your way through scores of Russian soldiers, once quelled the then typical Call of Duty formula kicks in and you eventually find your way stepping into the boots of various different characters, spanning a wealth of different locations (including Paris, London and even over the skies of Russia). Although it does offer fans that have been loyal to the series a fulfilling ending, there are some aspects that may detract from the overall experience, the lack of a co-op campaign being one of the most glaring ones. Also, expect some of the same annoyances that plagued you in previous campaigns to return, including lacklustre team-mate AI and grenades thrown with pinpoint accuracy (by enemies seemingly trained in the NFL). The flow of the game is easy to follow although novice players may become slightly disorientated as there isn’t a fix on a main character or location, throw in plenty of military terminology and you have a story that mainly the ‘die-hards’ will show enthusiasm for. Many of the cut-scenes you experience (if not all) are made using the in-game engine, which is a little bit of a shame as this is the finale of the trilogy. The developers wouldn’t have gone amiss with some nice visual aesthetic in the way of a few pre-rendered cut-scenes. That being said, Sledgehammer and Infinity Ward have remained true to their core practice and haven’t veered off the beaten path in their new instalment, whether or not that is appealing, is dependent on the guy behind the controller. Run for your damn lives!! On the easiest difficulty the game can be beaten in and around 4 hours, which is a little disappointing to say the least but the real ‘bang-per-buck’ ratio comes in the form of the Multiplayer. When it comes to multiplayer and especially playlist options almost no other console shooter can rival the variety that MW3 offers. The Spec-Ops mode returns and those who utterly enjoyed the MW2 version are in for a treat here as well. From an objective point of view it’s a shame that the total number of players wasn’t expanded to 4 but nonetheless the missions are just as entertaining as the single player but specifically tailored for 2 players. Throw in varying levels of difficulty per player and leader-boards to see how you rank up against the best and you have another fun, addictive component to the game. Survival mode is the series’ take on ‘Horde’ mode and sees you and one other person rank up whilst taking on waves of enemy AI. 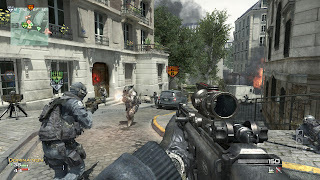 Kill-streaks, guns and special equipment become unlocked during the progress of the game and can be bought in order to use, to fend off the waves of enemy soldiers and juggernauts. I'm not going to help the guy on my left since he woke me up late for breakfast! • Specialist: The 3rd and final class (arguably for the more experienced Call of Duty players) disables kill-streaks and instead rewards the user by enabling them to unlock all the perks in the game. It’s a different and unique take to the classic MW feel but if used effectively, makes for many fun moments across many, if not all game types. A nice additional feature is that guns can now be levelled up individually with their own type of perk (for e.g. reduced recoil or 2 attachments) along with another welcomed feature; the ability to choose different kill-streaks for each class. Though there are some things that do require a fix, which has also been signified by the persistent stream of updates from Sledgehammer and Infinity Ward, many voices are still being heard in regards to spawn-points/’revenge spawns’. 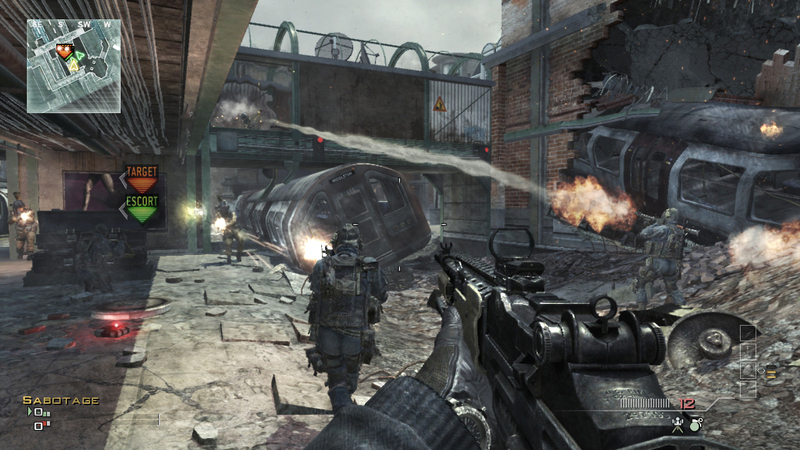 The frequency of certain kill-streaks appearing is another factor, with the benefit of being able to carry over your kill-streaks upon death with the Support class, be prepared for a bombardment of stealth bombers and EMP’s during online competitive play, whether or not that is a gripe is dependent on the player. That being said, the winning formula that has served to make this game an industry juggernaut has barely changed and judging from the amount of hours on average gamers spend online; I doubt this one will be any different. The major difference this year is the addition of the Call of Duty Elite service which basically serves as a large summary database full of features such as, where you’ve killed/been killed; you’re friends’ kill-death ratios and customised classes etc. It is a free or subscription based service with the paying alternative setting you back a hefty £39.99, it’s pretty steep considering it is the equivalent of a Call of Duty social network, throw in things such as uploading user videos to YouTube (for the paying subscription) and the price still isn’t justifiable. Call of Duty Elite also comes with its own mobile app (for iPhone & Android smartphones), allowing those to satisfy their addiction, on the go, with up-to-the minute stats and leader-boards. It’s a neat service but one that could’ve come into play as early as Bungie.net’s free equivalent several years before. That being said, most fanatics will enjoy this added feature but I suspect the majority of them will be riding the “free” version. Forgive me for incorporating the two together into one cohesive paragraph but the fact remains; the game fundamentally has stayed the same over a period of 4 years. There is a feeling of “if it ain’t broke, don’t fix it”. The graphical evolution has been very minor, the menu’s still have the overall look and feel of past Call of Duty titles and there’s also been a more noticeable delay in how long it takes to accept game invites/join people’s lobbies. 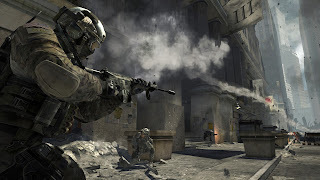 The game engine remains pretty much the same with a few enhancements being made to the 2009 appealing Infinity Ward engine 4.0. That being said, it’s a bit of a shame that developers and publishers are asking consumers to shell out £40-45 for what is fundamentally a game they’ve seen before. This pose makes me look cool... right? The controls and mechanics have remained the same since the 1st Modern Warfare (2007); in all honesty the biggest difference in the entire series was the enhancement of the multiplayer from MW to MW2. MW3 strangely feels as if it’s an expansion pack or as others have famously noted “MW 2.5”. MW3 seems to still be plagued with issues (online especially) such as laggy character models & lack of bullet registration, which should’ve been addressed as soon as they realised it was an issue in MW2. If you’re under the impression that MW3 is a totally different experience or better yet, a more total experience than the previous entries in the series, I’d strongly urge you to reconsider. The formula which has led it to become the largest selling console FPS shooter of all-time is still here and there hasn’t been much done (at the grass roots) to deliver a refreshing or even slightly altered experience. To conclude, MW3 is a fitting end to what started off as hearsay and backroom chatter between the original Infinity Ward and Activision. The series has matured into something that is not only instantaneously recognised by its 3 letter acronym in the gaming industry but recognised in the media, worldwide. The game engine hasn’t evolved significantly enough over the past 4 years and the aesthetics are definitely starting to show their age but in regards to the fundamental gameplay, that has caused endless queues at midnight and numerous sick days being taken, it still shines. One thing I will say is that Call of Duty is not successful due to its realism but due to the ‘fun-factor’ it offers, if you’re looking for a more genuine representation of warfare then I suggest you look elsewhere. Otherwise if you’re a die-hard Modern Warfare fan or even just a casual FPS’er look no further, MW3 is the multiplayer experience to dive into this Holiday season…or at least tide you over until the next annual instalment.